wdnicolson.com - An NRL Blog: NRL 2013: Eels share the captaincy... or do they? NRL 2013: Eels share the captaincy... or do they? SO WHO IS THE REAL CAPTAIN AT PARRAMATTA? Through the magic of social media... or a well placed leak at the Parramatta Eels - the club announced late Wednesday night that they would have a pair of co-captains and a club captain leading the side in 2013. The idea of co-captains isn't new, and neither is the club captain role (South Sydney anointed what seemed like 84 captains last year). But when Parramatta coach Ricky Stuart inherited the worst squad in the NRL per the standings from 2012, he knew he would be losing his captain Nathan Hindmarsh to retirement as well, so not only did he need to re-shape his squad but he needed a new skipper as well. He wisely decided to spend the entire off-season training the team to evaluate the best contenders for the Parramatta captaincy - a role that has been filled by the likes of Peter Sterling, Ray Price, Steve Edge, Dean Pay and most recently Nathan Cayless and Hindmarsh. Now Stuart has made his decision and he has decided to go with a pair of co-captains on the field in Jarryd Hayne and Reni Maitua. Hayne is the face of the Eels and having just turned 25 - is entering the prime years of his NRL career and is the greatest hope that Parramatta have of lifting themselves off the bottom of the ladder. Maitua has endured the highs and lows of Rugby League, and though he turns 31 this coming season - his two years out of the game due to a drug suspension means his body has endured only 138 NRL games - so he should still have a couple of seasons left in him. So what about Tim Mannah you may ask? Mannah has been mentioned as a potential successor to Hindmarsh for a couple of seasons and it seemed that only the elevation of Hayne to the top job would see him miss out as Parramatta's skipper. But then the interesting part of Stuart's decision comes to light - Mannah will be the Parramatta club captain in 2013. Need an update on who will or won't play in Round 1? But what does that mean - especially if Hayne and Maitua are the on-field co-captains? Well it means that you'll see Mannah as the face of the Eels everywhere... just not on the Big League team lists, at the pre-game coin-toss or in regular referee discussions on the field. In short, Mannah is going to do all the things that a singular NRL captain is obligated to do, without being the on-field 'decision maker'. He'll be out in the community, at official club functions, visiting sponsors and probably fronting every training/official press conference the club has during the week... and odds are he'll probably do his fair share of post-game press conferences despite not being the captain in the game just played. Sounds like a dud deal for Mannah right? Mannah is a good footballer, not a great one by any stretch but he's by all reports a fantastic bloke who appears to have the perfect personality to graciously fulfil all the off-field roles that a captain is obligated to do. In fact he might even enjoy it. Handing Mannah the club captain role means both Hayne and Maitua can concentrate on their football and getting the best out of their team-mates come game day. Stuart has obviously thought long and hard about what kind of extra pressures that making Hayne or Maitua the singular captain would bring, and decided that to get the best out of them - they needed the captaincy without all the extras. Stuart and the Eels have chosen a captaincy mix that will attempt to manage the demands on the modern day player/captain with getting the best out of their best players. And that makes a whole lot of sense. Now all the club has to do now is win... and that might be a touch more difficult than easing the pressure on their star fullback - which this move appears to have a great deal to do with. 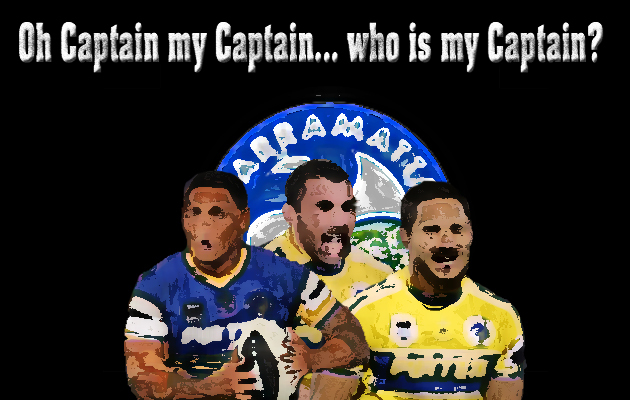 In your opinion - who is the real captain at the Eels? An on-field co-captain or a do everything else club captain? Or should it just be one captain doing everything? If we are missing any players on this list - please comment below, reply on Twitter or email this address. 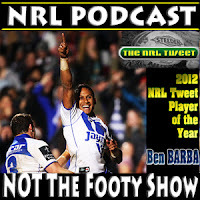 Can Ben Barba repeat as champion in the 2013 @NRLTweet Player of the Year Awards? The Prestigious Award returns for a 4th season in 2013. NRL 2013: Who wants to be an All Star?